In 862 missionary brothers Cyril & Methodius were sent by the Byzantine Emperor, at the behest of a Moravian Prince, to explain to the Moravians the truths of the Christian religion in their native tongue. In 869, upon witnessing the success of the brothers in spreading the Gospel, Pope Adrian II both sanctioned their mission and approved the use of the Slavonic language in the Holy Liturgy. Cyril is credited with translating Holy Scripture into the Slavic tongue, and the Cyrillic alphabet generally attributed to him is more likely the outcome of his work on the Golgolithic alphabet, upon which the current Cyrillic alphabet is based. 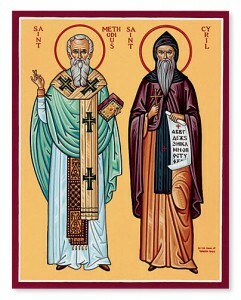 Saints Cyril & Methodius are honored by the Church’s official title Equals to the Apostles. In 1880 Pope Leo XIII extended the veneration of Cyril & Methodius to the entire Catholic Church. 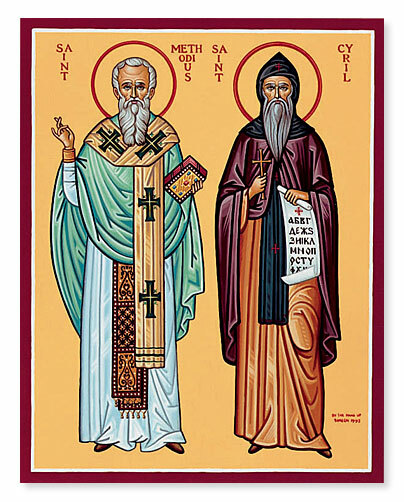 In 1980 Pope John Paul II, himself of Slavic descent, proclaimed Cyril & Methodius “Co-patrons of Europe.” We celebrate their feast day on May 11th.